With Democrats taking control of the House of Representatives and the former chairman of the House Transportation and Infrastructure Committee headed to retirement, all eyes are on Oregon Rep. Peter DeFazio as he heads toward his presumed appointment to the panel’s chairmanship. In a recent interview, he pledged to continue to prioritize freight policies, just as Rep. Bill Shuster (R-Pa.) — who will retire from the House at year’s end — did during his tenure leading the panel. “It’s just critical that we focus on more efficient movement of freight, particularly in a just-in-time world economy,” DeFazio said. 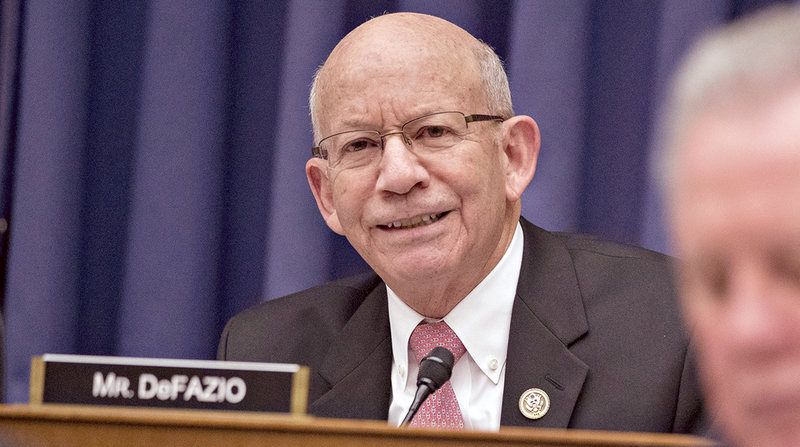 When Congress kicks off its next session in January, improving connectivity along key freight corridors and conducting oversight of major trucking policy issues will be priorities for the committee over the next two years, DeFazio said. Congestion continues to impede the efficient movement of trucks across the country. For instance, a study by the American Transportation Research Institute determined that in 2016 highway congestion saddled the trucking industry with $74.5 billion in operational costs. Other trucking policies at the U.S. Department of Transportation will merit additional oversight. Those include the Federal Motor Carrier Safety Administration’s rules on hours of service, the Compliance, Safety, Accountability program for rating trucking companies’ safety performance and ongoing concerns regarding commercial drivers’ detention time, DeFazio said. The Trump administration has signaled intent on updating hours-of-service policy, and officials continue to review ways to improve CSA. The comment period on the petition has ended, and FMCSA has yet to announce further updates. Missouri Rep. Sam Graves, the Republican vying to fill the ranking member role at the full committee next year, has expressed support for ATA’s meal-and-rest-break petition. Graves was among a bipartisan group of lawmakers that reached out to Chao to express their support for ATA’s petition. The letter was one of three separate letters transportation leaders and other senior lawmakers have sent to the secretary to express their concerns with California’s meal-and-rest-break law. “The trucking industry has raised concerns that state meal-and-rest-break laws cause a significant impact on the industry and impair the safe and efficient delivery of goods,” Graves and others wrote to Chao in a Sept. 25 letter. However, Graves also has praised DeFazio for his passion for improving the country’s infrastructure. During his time as the panel’s current ranking member, DeFazio — who was first elected to Congress in the mid-’80s — has emphasized his familiarity with freight policy, noting he helped to advance provisions in the 2015 highway law that were designed to enhance freight projects at ports and areas of regional significance. DeFazio will have his national profile elevated if President Donald Trump promotes infrastructure policy next year. DeFazio has supported raising fuel taxes to boost funding for infrastructure projects and said he would prefer for the president and Republican colleagues to propose plans that would be anchored on federal sources of revenue. Trump’s 10-year, $1.5 trillion infrastructure plan unveiled in February relied heavily on backing from the private sector. “The question is how are you going to pay for it and that always becomes very challenging because there’s no sort of easy way to pay for infrastructure without impacting an awful lot of Americans,” Senate Majority Leader Mitch McConnell (R-Ky.) told reporters Nov. 14. While a few Democrats have endorsed higher fuel taxes to back long-term funding for infrastructure projects, most Republicans have argued against it. The current 24.4-cents-per-gallon diesel tax and 18.4-cents-per-gallon gas tax are no longer sufficient to sustain the federal Highway Trust Fund account long-term. The trust fund assists states with big-ticket infrastructure projects. Bill Sullivan, ATA’s executive vice president of advocacy, told Transport Topics that over the years ATA and DeFazio have seen eye-to-eye on myriad issues. He expects DeFazio to adopt an inclusive approach when freight policies come before the panel.